14x16", 225 hp 140 rev engine; Richardson Iron Works, Manitowoc, WI. Boiler 8x7'2" Manitowoc Boiler Works (1892), 140# scotch. 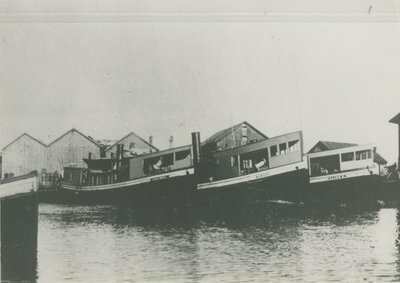 Similar tugs ALICE C. (1901) & BURGER (1903). 1899 Freight & passenger use. 1907 Owned Alice B. Coffey, Manistique, MI. 1925 Owned John Girvin, Manistique, MI. 1937 Out of documentation; abandoned. Sometimes ran out of Escanaba in earliest 10 years.